Have you tried maca root powder yet? Maca root is a tuber, kind of like a potato. It is very well known as a natural energy booster. It can also help with hormonal issues such as menopause and fertility. Maca is rich in B vitamins as well. It can be pricey, but I promise that a little goes a long way, so the bag will last a long time. Kind of like chia seeds. You may even be able to buy maca powder out of the bulk bins at Whole Foods. I love putting maca powder in my Chocolate Almond Butter Overnight Oats because it adds a malty flavor that goes well with the chocolate. These Maca Energy Bites will not only give you a natural energy boost, but also a pretty good protein and fiber boost as well. If you enjoy my Maca Energy Bars, you will love these! 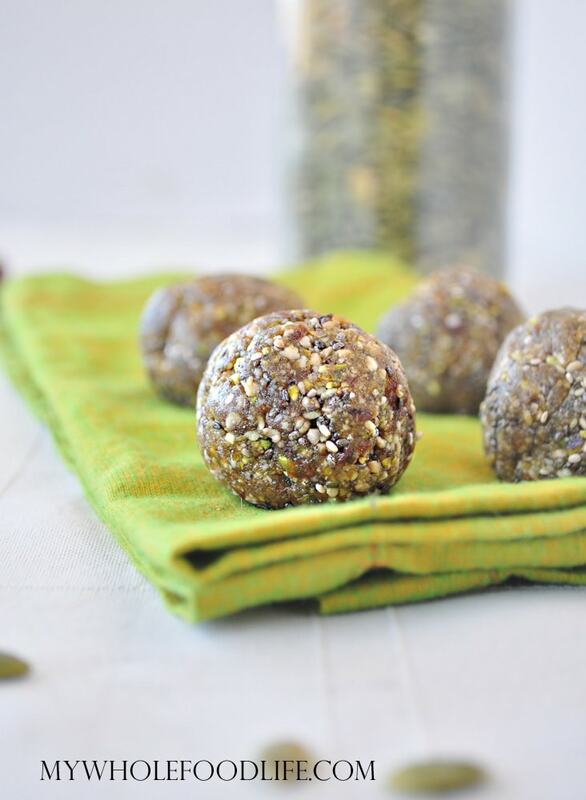 These energy bites are gluten free, vegan and grain free. If you need a nut free option, you can substitute the pistachios for rolled oats. Give yourself a natural energy boost! In a food processor , grind up the pistchios, chia seeds, sunflower seeds, pepitas, sea salt and maca powder to a coarse consistency. Lastly, add in the water, 1 tablespoon at a time until a dough starts to form. If you want to make these nut free, you can use rolled oats instead of pistachios. These balls should last for a couple weeks in the fridge. You can also freeze them.